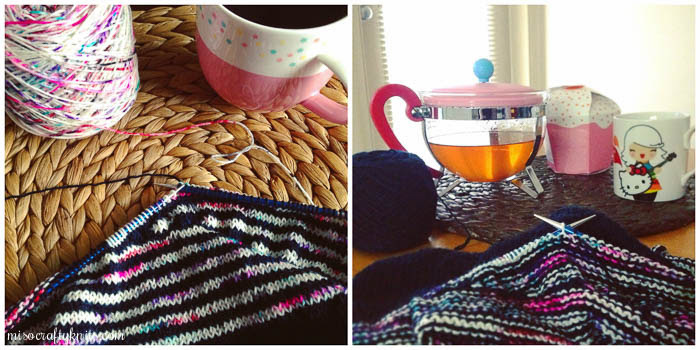 I realized a few days ago that I've been knitting away on a few WIPs that I have yet to mention on the blog. I've posted numerous photos of them on Instagram, even all the swatches of the different colour combination possibilities. Somehow though it totally slipped my mind that I haven't mentioned a word of these WIPs on the blog. Oops! I have a feeling that I did what I typically do with emails...in that I think up and write the email in my head, with the intent of actually doing so at a later time when I'm able to sit down for longer than five minutes or when I don't have the Kiddo yapping (and yapping and yapping...) away in my ear non-stop. In this particular case, I think I've written the blog post in its entirety in my head shortly after separating for the sleeves on one of the tunics. And then promptly forgot to actually type up said blog post. All I can do is roll my eyes at myself. At any rate, here we are and here I am finally telling you what's on my needles! It's Breathing Space by Veera Välimäki. Times two. That's right. You read that correctly. I said two. Well...this is what went down. Back in February when Veera Välimäki and Joji Locatelli released their third collaboration, Interpretations Vol. 3, the Breathing Space tunic immediately caught my eye. It was love at first sight. I schemed for days thinking about what yarns and colours I wanted and could use. I was really hoping to use stash yarn and didn't want to have to go to my LYS to buy any. I've been obsessing lately (in case you haven't noticed) about using as much stash yarn as possible. I like to think of it as "stash appreciation". I mean, I bought the yarn because I love it. Why not knit it up before bringing home new yarn? Anyhoo, even though I'm not a fan of using variegated yarns for garments (I don't like the idea of not being able to control how the colours play out), I liked how a speckled yarn was used in the Breathing Space sample and that the colours were broken up with alternating stripes of a solid colour. I can handle that. I tossed the stash and came up with only one skein of speckled-like yarn that I wanted to use: Captain Lovely by Lynai Yarns. It took me quite a while to find a complementary colour to go with Captain Lovely and I was so incredibly tempted SO many times to just run to my LYS to pick something up. But I resisted. My first swatch I tried using Madelinetosh Tosh Mo Light in a super vibrant purple (Ultramarine Violet) that I got during one of the Tosh sweater club rounds (pictured above at the top of photo), but thought the overly vivid colour took away from the speckled yarn. The second swatch was with Wollmeise Twin in a "We're Different Versuchskaninchen" colourway (meaning "guinea pig") that I think looks extremely close to Wollmeise's Admiral. At first I didn't like this combo because I thought the navy was too dark, but at the same time I liked how it sort of looked Breton shirt like and definitely nautical inspired. The more I looked at the swatch the more I thought about pairing Captain Lovely with a grey. Several people on Instagram thought the same thing too. The first grey I tried was Madelinetosh Tosh Merino Light in Composition Book Grey (I think) and immediately knew it was too light (pictured above). I found a skein of Wollmeise Twin in a darker grey called 47Ag but it was too...flat? If that makes any sense. Either way I didn't like it. Four swatches later and I decided to go with my second choice, the navy. So I cast on and all seemed to be going well. Until I took a step back and realized that I didn't like the way my short rows were looking. Ugh. Riiiiip! On the second try I decided to use Cat Bordhi's method of short rows instead of the version used in the pattern. MUCH tidier. I continued knitting along, pleased as punch with how the colours were working up. Then to my horror I discovered that my gauge was looking a bit off. I measured several times in different areas and realized yes, my gauge was off in the striping area only by two stitches!! I have a sneaking suspicion that two factors are at play here: 1) Captain Lovely is thinner than the Wollmeise; and 2) my hands were on the achy side when I started the stripes, which I've noticed has been causing havoc with my gauge. Instead of doing something completely and totally drastic I decided to just take a deep breathe and set aside the project. Then I fumed. For several hours. Then I did something crazy. I grabbed two more skeins of yarn and I cast on for a second Breathing Space. Yeah. Super crazy. Rather than sort out my gauge issues I thought "meh, let's just cast on another". Because that's what sane knitters do. Right? Don't answer that. Regardless of whether or not if my sanity is intact, I've been wanting to knit a "neutral" coloured (re: black or grey) garment for quite some time now. Since I have a good number of solo skeins and two skeins of the same colour in Wollmeise I thought this would be not only the perfect opportunity, but also the perfect pattern to use them up with. So for the second version I'm using Schwarz (black) as my main colour and Maus Jung (tonal grey) for the contrast. BUT guess what? Tragedy strikes. AGAIN. Sweater knitting mojo, where are you?? This time my gauge was way too loose, even though I was using the same needle size as I had used for the last swatch. Thankfully I didn't start the striping yet, but I did get a huge chunk of knitting accomplished on this in a very short time span. I like to think a normal person would've just stopped. They would've taken a break from knitting or at least cast on something completely different. Not me. I'm stubborn like an ox. Instead I frogged it all and re-cast on seconds later with the needle size I had used for the first three swatches. Much better. You'd think by now that all my bad luck has run out. Nope. I'm one of those knitters who thinks they know the pattern without actually reading it properly. Even though I printed out the pattern, read through it thoroughly (obviously not thoroughly enough), and highlighted numbers and a few very important instructions, I still carried on like I knew what I was doing. Have I not learned from the many mistakes I've already made with this pattern?? Guess not. On this second attempt on this second version I accidentally did an extra increase round on the yoke, then totally forgot I did that when I was finishing up the short row shaping on the body. It only dawned on me after I had tried on my work and thought the armholes felt a little tighter than I would have liked. I was perplexed but opted to keep the armhole as is, banking on the final weight of the tunic to help stretch it out in the long run. As I was knitting along, it hit me. When I divided up the sleeves from the body I didn't add the two extra stitches on each sleeve, so the body had an extra four stitches. Makes sense why I had to extra short rows to make the stripes meet up close enough on the one side. Man, you'd think I was a garment knitting noob. Once I got the second tunic all sort and well under way I decided it was time to tackle the first version. I laid it out and stared at it. I brought out my trusty knitting ruler and measured my gauge all over. Hemming and hawing ensued. A few minutes passed and I finally had a plan. 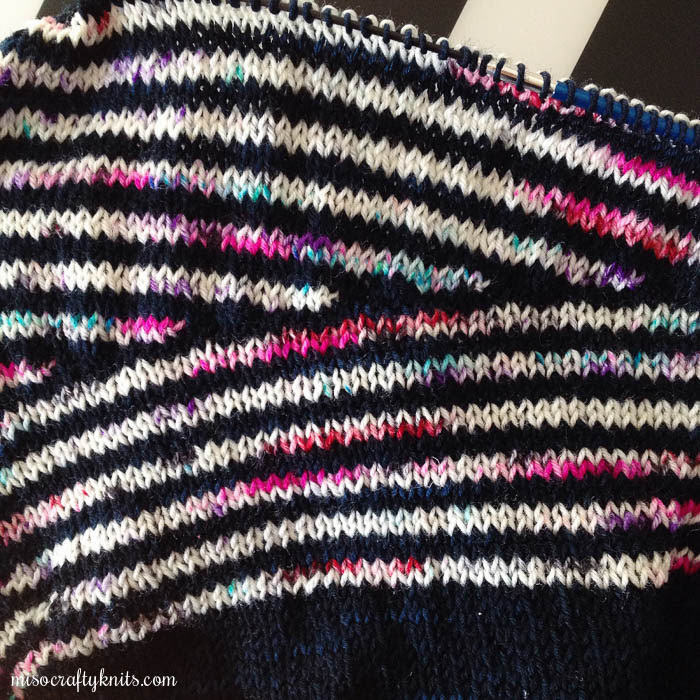 The yoke was perfectly fine and I didn't have gauge trouble until I started the stripes. I took a pair of circular needles in a size smaller and picked up all the stitches in the round before I started the first stripe and then frogged back to that needle. Since the 4mm (US 6) was too big for Captain Lovely, I thought I would give 3.75mm (US 5) a try. Now, you're probably thinking, would going down one needle size make a difference? Here's the thing, if I went down to a 3.5mm (US 4) the navy stripes would be too tight and dense. I figured I could make do with a compromise and use the size between. So I started knitting, divided up the sleeves from the body, started the short rows, kept knitting...the fabric seems fine to me. There's a one stitch difference between the two yarns, but overall I'm happy with what I'm producing and most importantly the tunic fits. Hopefully, all issues have been sorted out. Fingers crossed. After weeks and weeks of stupid little mistakes, I'm happy to report that both tunics are now under way and have been smooth sailing. I just finished the waist decreases on the first tunic and have picked up the second to do the same. I think to make the knitting go faster, and so that I don't get bored, I've been knitting a section on one tunic and then knitting that same section on the second. I expect that by knitting these tunics this way I'll get them done roughly around the same time. Or at least that's the thought process behind this method. It's like knitting socks. 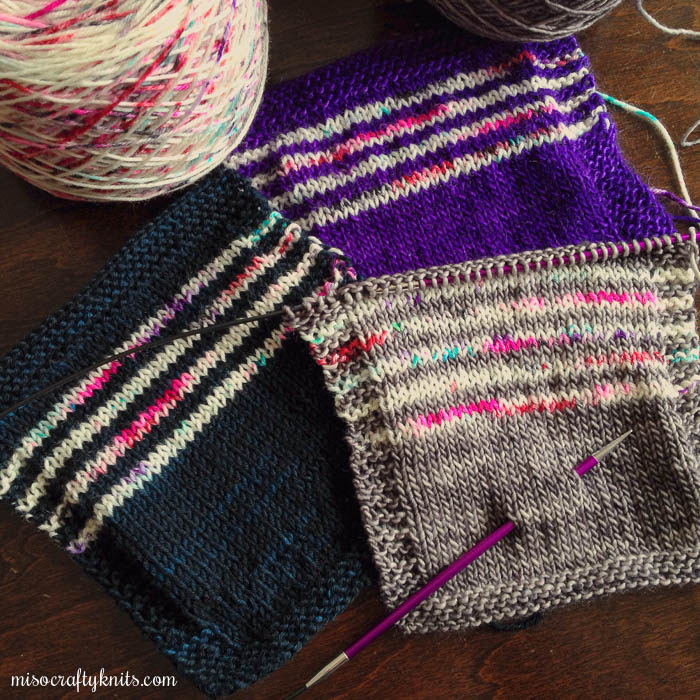 I like how a variegated yarn can be used for the stripes section. Faved this on Rav. Do you think the pattern will always be w/the ebook and not sold separately? I bought the pattern separately! I think the first few days/week it was in eBook only format?